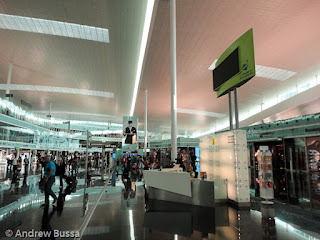 It is only a 20 minute taxi ride from the Four Points by Sheraton Barcelona to the new Barcelona airport terminal (RyanAir and EasyJet still use the old terminal). The new terminal is massive, giant, and huge. Way more than I was expecting and larger than the current traffic needs. I do like the architectural style of it, large windows, high ceilings, and long sight lines, but the layout means you are walking a lot to get anywhere. There is also prominent mall to walk through before you see any gates. None of this mattered at first because the Austrian Airlines check in line was massive. 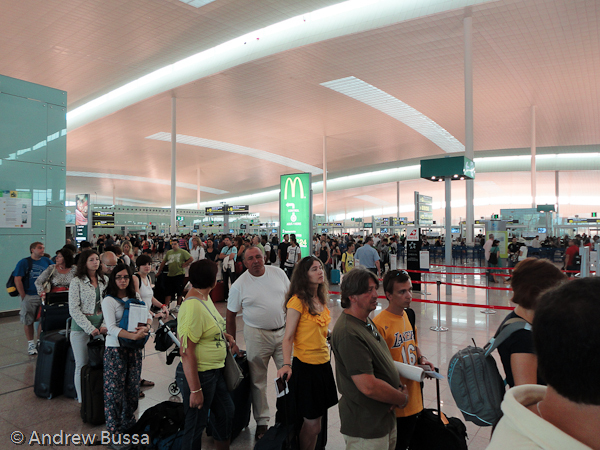 With only one flight about 2 hours away, the line looked like the entire plane had arrived to check in at once. It was awful, there were two desks and one was preoccupied with a family having visa issues. Luckily I saw Star Alliance Gold members can check in at the business class line with no one in it (my non-status friend was able to check in with me and skip the line). I waited my turn, expecting the visa issue family in front of me to take forever, but the economy desk agent waved me over in front of tons of people to check in. The process went quickly and no one in line attacked me for jumping to the front. 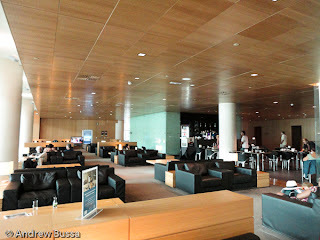 A quick trip through the security line and we were off to find the Star Alliance lounge, except there isn’t one. There is just one large shared lounge for all the intra-Europe flights. It also wasn’t well marked (it’s to the far right of the giant mall after security). Once inside I grabbed a coke and my Economist. My friend made good on his new year’s resolution to drink more Champaign and had two glasses before our 10am departure. There was also some light snacks available to munch on; I just had breakfast at the hotel so I did not partake. When boarding time arrived, we walked to our gate. And walked. And Walked. Only to not see a plane parked, but find a bus waiting for use. I dislike boarding buses and going to stand positions, especially when there is a perfectly good jet bridge available. The buses slow everything up and add stress that isn’t needed (You can get some good pictures though). I prefer to be the last person on the last bus that leaves. That way I get a window spot at the bus door and am the first one off and up the stairs to board (don't worry about bin space, Europeans rarely fill the overhead space). We waited at the gate for everyone else to go and then we were the last ones on the bus. The aircraft was an A320 in a retro Austrian Airlines livery. Inside, the plane looked new with Lufthansa Group’s slim line seats. 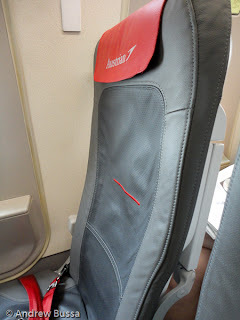 These seats are super narrow, weigh less, and have redesigned seat back pockets and tray tables. 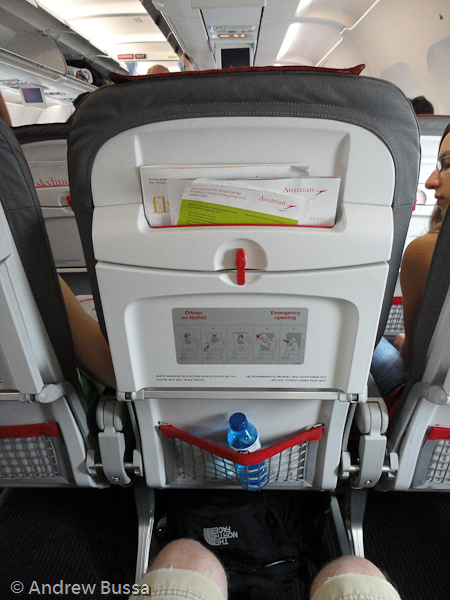 They let the airline fit more rows on board while giving customers a greater feeling of space. The flight left late and arrived early. I had the first exit row, so plenty of leg room, but the seat did not recline at all. 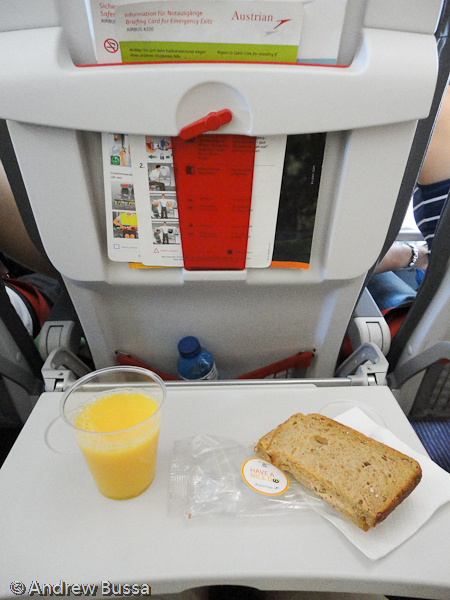 Service was prompt and included a sandwich and drink for the two hour flight. I was able to do some reading and enjoyed the quick hop to Vienna. 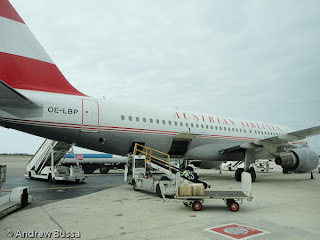 After a quick taxi to the gate we were off to see Vienna, but not before grabbing a few Austrian Airlines post cards first.